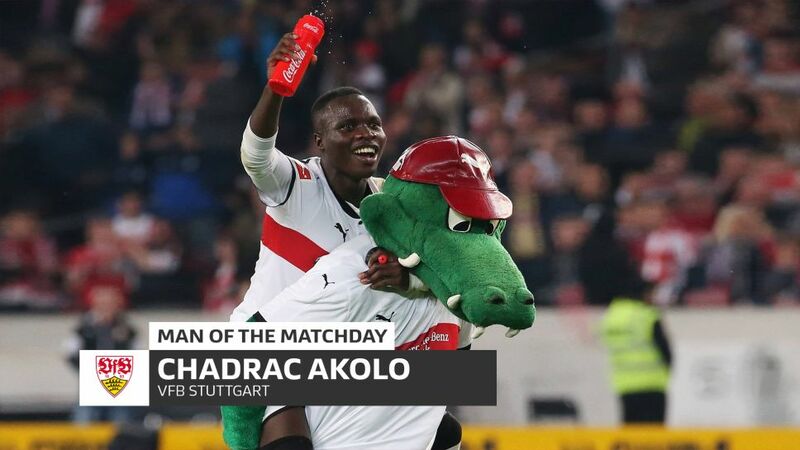 Stuttgart striker Chadrac Akolo won his team three points in the most dramatic of fashions against Cologne on Matchday 8. Chadrac Akolo was named among the substitutes for Stuttgart against Cologne on Friday evening, but it's fair to say he'll be one of the first names on coach Hannes Wolf's team sheet next week. The 22-year-old came off the bench in the second half against the Billy Goats to net a dramatic, injury-time winner against the league's bottom club. The DR Congo striker returned from international duty with a cold and was therefore not fit enough to start, but he certainly left his mark on the game, providing the crucial intervention and ensuring Wolf will think twice about leaving him on the bench again. "It's the most important goal in my career so far," he said elatedly after the match. "To score the winner in front of those amazing fans was just unbelievable. I'm really happy that I could help the team with my goal." After signing from Swiss side FC Sion in the summer, Akolo has quickly established himself as a key attacking weapon for the Swabians, netting three times in six appearances against Schalke, Wolfsburg and now Cologne. In a team that does not score exactly freely - VfB have managed six in eight matches - he is worth his weight in gold to the 2007 Bundesliga champions. Akolo's next opportunity to shine is away to one of the league's "big boys", RB Leipzig, where Stuttgart go in search of a first away win of the campaign. Click here for more VfB Stuttgart news and features! Click here for the Stuttgart vs. Cologne Match Centre!